As you may know, my husband Gardener Ted and I owned and operated a floral shop, greenhouses, and garden center for nearly 20 years. Christmas season for us began in August when all the holiday items arrived at our doorstep from the distributors. Not only did we unpack and find room for all these delightful ornaments, figurines, holiday vases, candles, artificial trees, wreaths and garlands, but we also had to begin creating artificial Christmas arrangements to be ready for the Christmas Open House which was usually the first weekend after the Opening Day of Deer Hunting, November 15, in Michigan. While the men (and yes, ladies too) went off to hunt, the "deer widows" went shopping. We had to be ready to capture those sales. We were busy elves during the season for sure. One of the most time-consuming jobs was to unpack the artificial trees and wreaths and "fluff" them. I was reminded of this when my dear hubby bought a new tree this year during the Black Friday sales event. I mean this was as tall as our 7.5 foot ceiling in our place in Florida. And wide, yes very wide, with tons of gorgeous colored lights and white lights with 8 different lighting display options. Our tree completed. Don't look at the back. I need to get MORE ornaments for this bigger tree. I tackled the job of turning the mashed branches of this dead looking piece of wire and green needles into a lovely, almost "real" looking Christmas tree. So I spent a lot of time "fluffing" the branches into what turned out to be a gorgeous tree. I mentioned on Facebook I had fluffed the tree. When one of my friends on FB shared the post, his daughter told him that fluffer was a word connected with making pornographic movies. Say what? My jaw dropped to the floor. Word meanings are always changing. I remember when we sang the Christmas song with the words, "don we now our gay apparel," my young grandson whispered to me, "Did they say gay?" In his lifetime the word gay was never used for the older definition of happy. When I went to college, we used the word pimp to mean somebody did you wrong. My mother practically had a heart attack when I used it. The meaning for pimp in her mind was the man who arranges clients for prostitutes. Have you heard the term "to pimp my ride?" That means to customize an automobile. Want to look up a word? Google it. Now who ever heard of that prior to 1998 when the Google company was founded? And who knew Google would become a verb? Have you been caught unknowingly using an inappropriate word? What are some more words that have been turned into verbs? Because it IS Christmas time and a time for giving, I'd like to give you the gift of a FREE e-book. No drawing. No treasure hunt. No Rafflecopter entry. If you would like to receive a PDF copy or Kindle formatted copy of Dangerous Sanctuary, please let me know by requesting a book in the comment below or sending me an email at jqrose02 at gmail dot com. . Deadline for requests is Saturday, December 17, 10 pm EST.. I would receive such joy by giving you this sweet romance/mystery, a perfect read for a quiet time during your hectic Christmas preparations. If you have read Dangerous Sanctuary or the original title Coda to Murder, please leave a review for the book at http://amazon.com/dp/B01MQIFQFI Reviews are very important so readers can find books on amazon. Thank you. 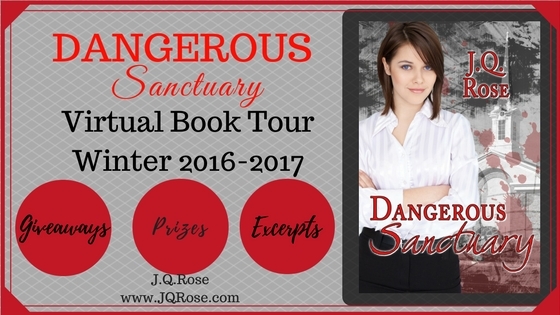 during the Dangerous Sanctuary Virtual Book Tour. Please join me on the Virtual Book Tour to win more prizes and read excerpts from the book. Really interesting post, J.Q.! I can imagine how busy you were owning a floral shop. Your Christmas tree is beautiful. You did a great job of "fluffing" and decorating! Merry Christmas to you and Gardener Ted! Thank you, Susan. The tree was so pretty without the ornaments, I hesitated to hang all the "stuff" on it. Nice tree. I did my shopping online but I did catch a couple of black Friday deals. You did a fine job with your tree! I remember the first time I saw an an artificial tree as a kid, I was horrified. Then my big sister stepped in and made it gorgeous! Our tree this year is very round. Daughter #2 had to have it, but even she calls it "clinically obese." Hi Juneta. Glad you got some "deals" this year too. Online shopping sure has changed the way people shop. Merry Christmas to you too! Thank you, Tess. I never thought I would ever have an artificial tree. My daughter still gives me a hard time about it. She's a purist. I'd love to see the clinically obese tree you have this year. That description made me laugh. Pictures? Merry Christmas! !